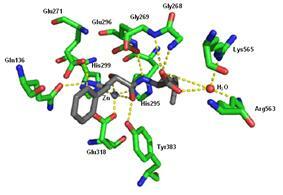 Ubenimex (INN), also known by the brand name bestatin, is a competitive protease inhibitor. It is an inhibitor of aminopeptidase B, leukotriene A4 hydrolase, and aminopeptidase N. It is being studied for use in the treatment of acute myelocytic leukemia. It is derived from Streptomyces olivoreticuli. Crystal structure of ubenimex in the binding pocket of leukotriene A4 hydrolase. Rendered from PDB 1HS6. ^ Umezawa,H., Aoyagi,T., Suda,H., Hamada,M. & Takeuchi,T. (1976). "Bestatin, an inhibitor of aminopeptidase B, produced by actinomycetes." (29). pp. 97–99. ^ Muskardin,D.T., Voelkel,N.F. & Fitzpatrick,F.A. (1994). "Modulation of pulmonary leukotriene formation and perfusion pressure by bestatin, an inhibitor of leukotriene A4 hydrolase." (48). pp. 131–137. ^ K Sekine, H Fujii and F Abe (1999). "Induction of apoptosis by bestatin (ubenimex) in human leukemic cell lines" 13 (5). pp. 729–734. ^ Hirayama, Y; Sakamaki, S; Takayanagi, N; Tsuji, Y; Sagawa, T; Chiba, H; Matsunaga, T; Niitsu, Y (2003). "Chemotherapy with ubenimex corresponding to patient age and organ disorder for 18 cases of acute myelogeneous leukemia in elderly patients--effects, complications and long-term survival". Gan to kagaku ryoho. Cancer & chemotherapy 30 (8): 1113–8. ^ Bauvois, B; Dauzonne, D (January 2006). "Aminopeptidase-N/CD13 (EC 3.4.11.2) inhibitors: Chemistry, biological evaluations, and therapeutic prospects". Medicinal Research Reviews 26 (1): 88–130.